The National Geographic Traveller magazine has included Jetwing Vil Uyana in Sigiriya in its list of the ‘World’s Best Ecolodges’. Launched in 2006, the Vil Uyana has been a member of the ‘Small Luxury Hotels of the World’ since its inception and continues to offer superb accommodation and service. 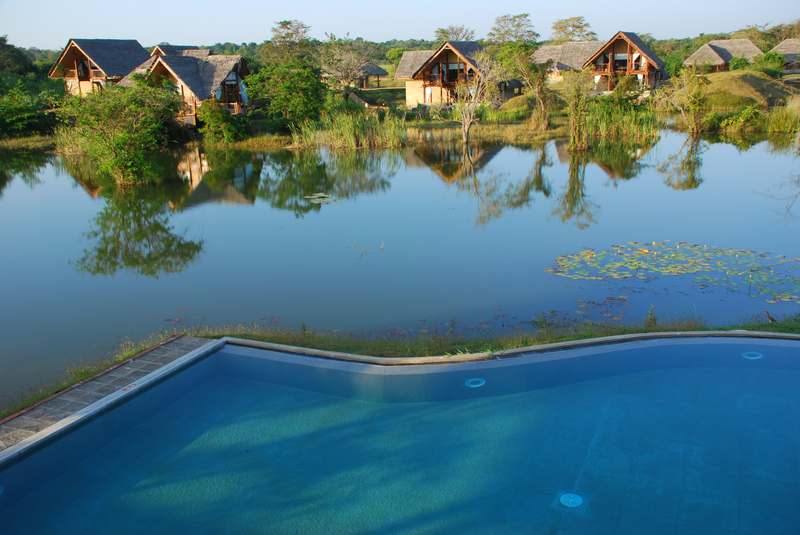 With 25 dwellings situated over four distinct habitats – water, forest, paddy and marsh – the lodge is located close to the famous Rock Fortress of Sigiriya and is a pioneer of eco-tourism in Sri Lanka. Jetwing Vil Uyana joins other innovative lodges from all over the world, from countries such as South Africa, Greece, China, Poland, and Indonesia. “This year marks the 125th anniversary of the National Geographic Society. The lodges we selected capture the Society’s spirit of exploration and commitment to the environment,” Associate Editor Amy Alipio said. You can enjoy a stay at Jetwing Vil Uyana on several World Discovery tours, including the popular ‘Sri Lanka Highlights’. After a fire damaged the thatched roof of the restaurant of Erongo Wilderness Lodge on the 30th July, we are very happy to advise that the damage has been repaired and the lodge re-opened as planned on the 20th August. A dedicated team worked quickly and professionally to repair the damage as quickly as possible and the restaurant is now restored to its former beauty. The lodge is once again fully operational. Erongo Wilderness Lodge can be booked as part of a Namibia tailor made holiday with World Discovery. With a radical design to rival Singapore’s ‘cruise-ship-on-stilts’ shaped Marina Bay Sands – the newest landmark hotel in China has grabbed global headlines for its horseshoe shape. 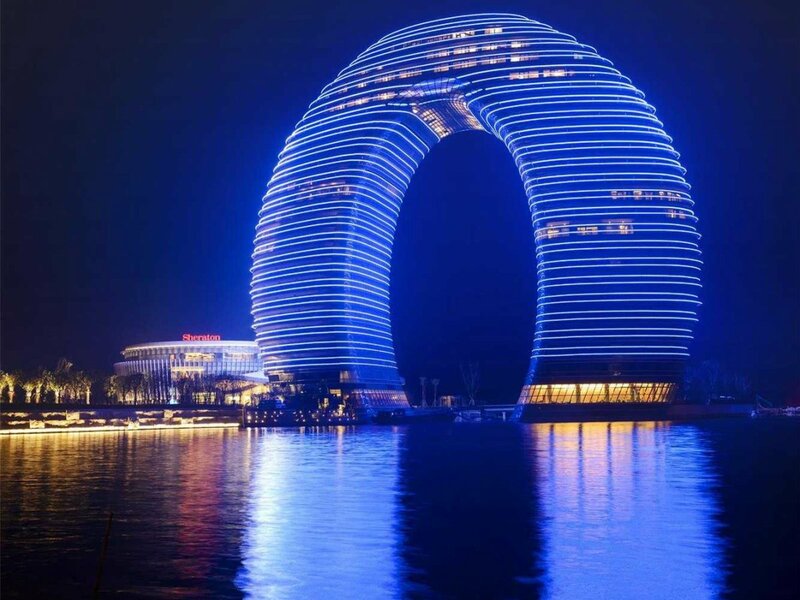 The Sheraton Huzhou Hot Spring Resort near Shanghai has been labelled the ‘horseshoe hotel’ by locals because of its curved U-shape. The eye-catching 27-level building is actually a full oval, with two basement levels that connect underground. The property has 321 rooms, including 44 suites and 39 villas, with private balconies overlooking Lake Taihu. The hotel’s interior is lavishly decorated with 20,000 Swarovski and European natural crystal lamps that create a wave-like formation across the ceiling. The lobby floor is paved with Afghan White Jade and Tiger’s Eye Stone from Brazil. For guests who want to celebrate their special day, there is a 1,600 square metre private wedding island and a full time wedding coordinator on hand to make sure all nuptials go smoothly – with the ‘horseshoe hotel’ for added good luck! A gold seal of approval introduced by the Angkor Handicraft Association will ensure bargain hunters purchase authentic Cambodian souvenirs. Many visitors to Siem Reap’s markets energetically bargain for Khmer arts and crafts unaware that some products originate from foreign countries. 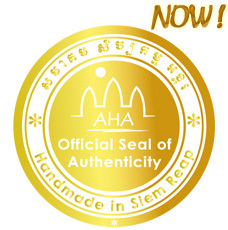 However, the recently introduced “Gold Seal of Authenticity” at the Angkor Handicraft Association’s “Made-in-Siem Reap” Market will give consumers greater peace of mind they are purchasing the real deal. The market has 28 stalls offering a variety of locally made goods ranging from Khmer stone carvings, leather shadow puppets, traditional checked scarves, bags made from rice sacks, paintings, ceramics and water hyacinth plants expertly weaved into all manner of items including bracelets and placemats. The facility offers much more than a retail experience as visitors can also enjoy impromptu Khmer themed shows. 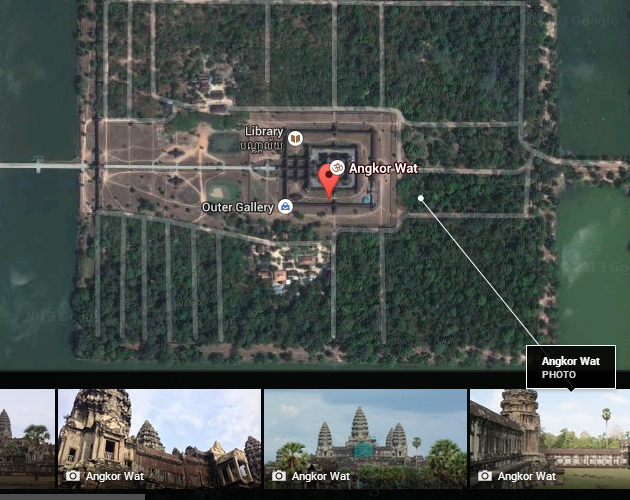 Google has started mapping the ancient temples of Angkor Wat and the streets of the capital Phnom Penh. The Angkor Archaeological Park covers an area of 400 sq-km and the mapping process is expected to take six months. After capturing Angkor and Phnom Penh, Google plans to fan out and photograph other destinations across the rest of the country for their online Google Earth website. As with other locations already mapped, the US technology giant will use special cars mounted with 360⁰ cameras to collect images. Google and government officials said the initiative will help showcase Cambodian culture and raise awareness about the country as an attractive tourism destination. The Angkor complex is one of the greatest historical attractions on earth that dates back to the 12th Century. It was built by King Survayvarman II as his state temple and eventual mausoleum. 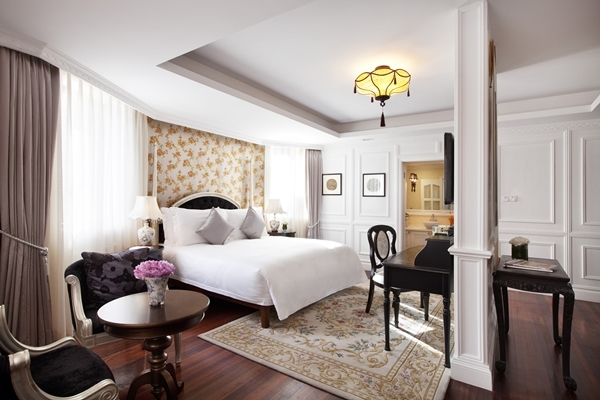 A new boutique hotel takes guests back to the golden era of Shanghai in the 1930s. Once the home of Shanghai’s famous Sun family and listed as a historic site, Le Sun Chine is old Shanghai to the hilt; it has been tastefully restored to its former glory with period architecture such as columned balconies, antique furniture and high ceilings with whirring fans. Rooms are furnished with a classic European sensibility including herringbone hardwood floors, Chippendale cabinets and reproduction phonographs that have been converted to play CDs. No two rooms in the building are the same and they are all named after the streets of old Shanghai when the city had French and English names. The hotel is part of the Relais and Chateaux group – an elite and exclusive affiliation of luxury global hotels that aim to provide an experience unique from the bigger global chain properties.